Client: Longmen Mt. 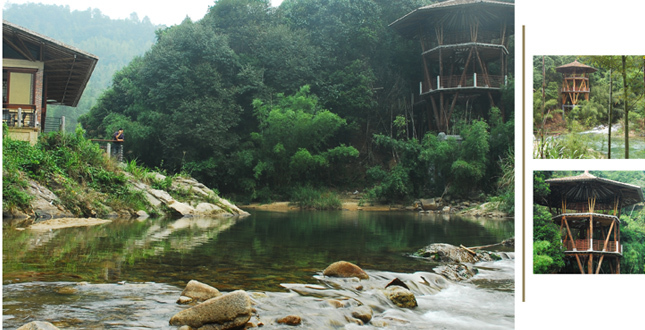 Nankun Zhongheng Ecotourism Development Co. Ltd.
Nankun Shan Mountain Nature Reserve is located in Central Guangdong and 80 miles from Guangzhou. 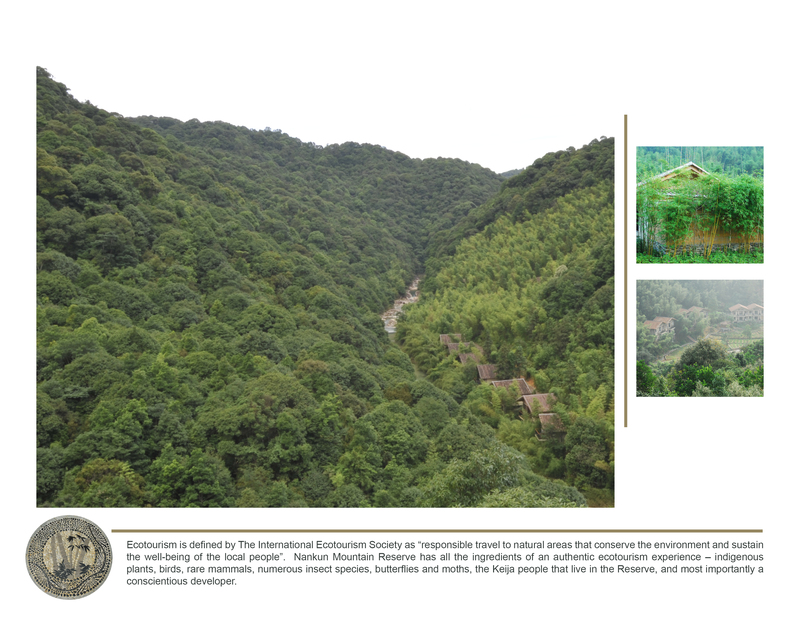 The reserve was established in 1984, and its major objective is to protect the subtropical evergreen broadleaf forest. Feng shui analysis of the master plan helped to harness the 'chi' of the site. 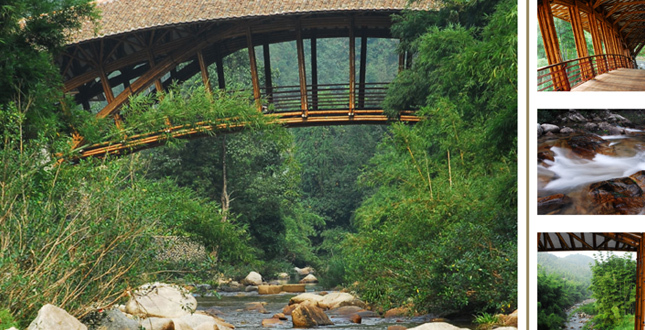 The entry bamboo bridge is located on the feng shui 3 degrees of north–south axis and the main buildings are all symmetrical to this axis. 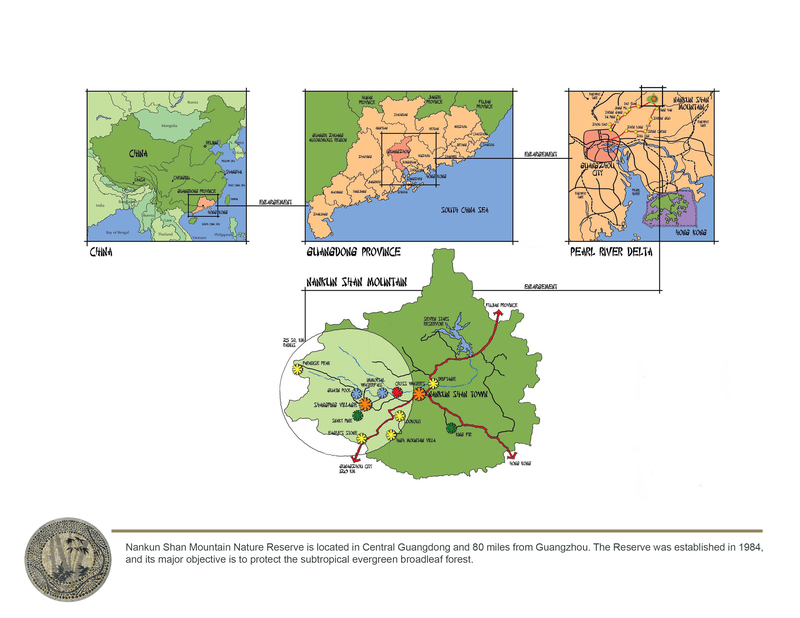 The reserve lies within the boundaries of the Nankun Shan Forest Park, which covers an area of 260 square kilometers. 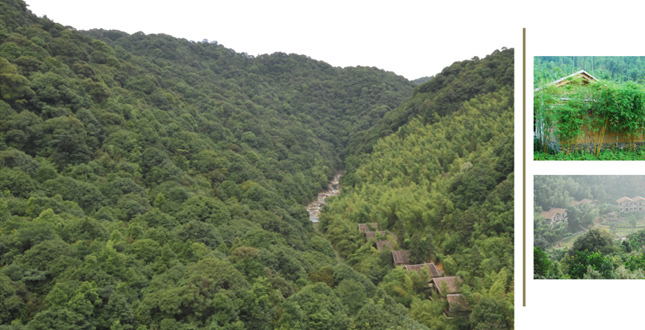 There are over 1,300 plants in the park with over 30 square kilometers of bamboo. Over 74 bird species and more than 176 species of butterflies exist in the Reserve. The design team immersed themselves in the community and local government thus winning their trust which was crucial to the success of the project. 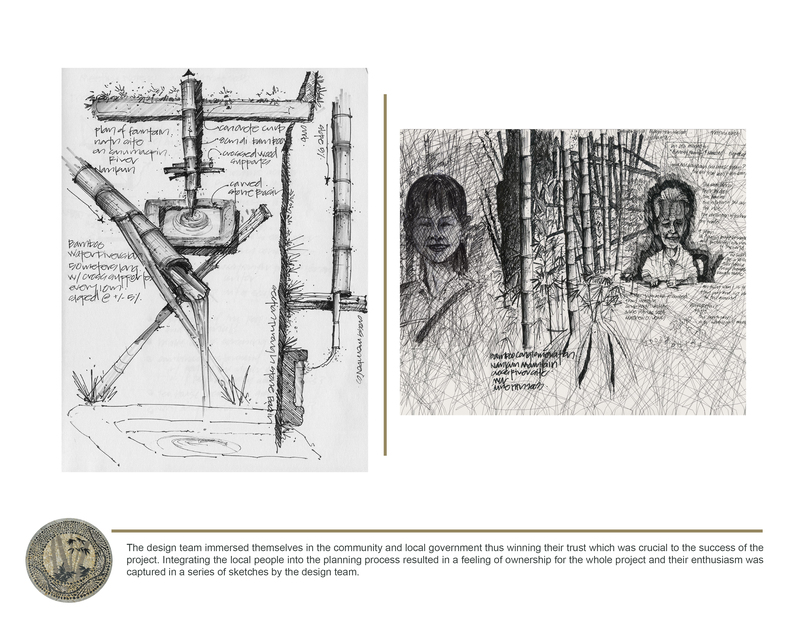 Integrating the local people into the planning process resulted in a feeling of ownership for the whole project and their enthusiasm was captured in a series of sketches by the design team. 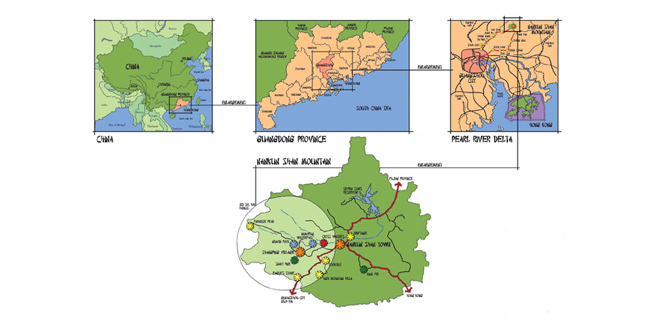 Studies were conducted of the riparian corridors of the Sumaoping and Ganken rivers, slope aspects related to feng shui, vegetation growth to determine quantity and quality, and slopes to identify construction suitability. 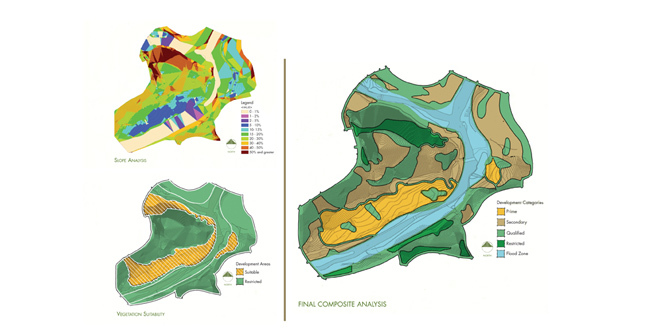 Individual composite drawings were overlaid resulting in a final diagram showing areas of prime, secondary, qualified and restricted site potential. Ecotourism is defined by the International Ecotourism Society as "responsible travel to natural areas that conserve the environment and sustain the well-being of the local people." Nankun Mountain Reserve has all the ingredients of an authentic ecotourism experience—indigenous plants, birds, rare mammals, numerous insect species, butterflies and moths, the Keija people that live in the reserve, and most importantly a conscientious developer. 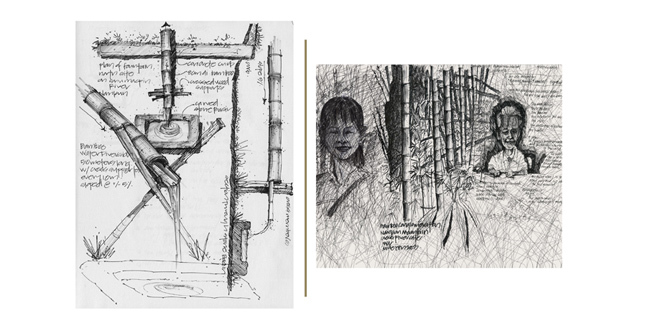 Upon arrival, paths wind you through the bamboo forest and past a water feature called "The Poet's Fountain." Constructed of granite and bamboo, it is named for the Chinese poems inscribed onto the medallion positioned over each fountain. Each poem relates to the three major features that make up Crosswaters Ecolodge: the river, the mountain and the wildlife. 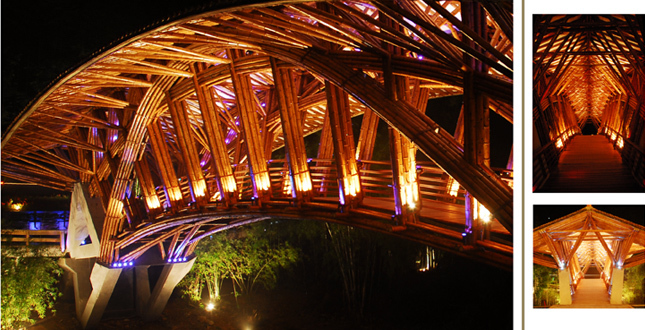 The bamboo bridge was designed by acclaimed bamboo architect, Simon Velez. Local craftsmen were mentored in its construction by nonlocal artisans, offering an opportunity to become skilled in new building techniques that can be applied toward future assignments within the community. Lights on the bridge beautifully highlight the magnificent structure at night. Intricate details come alive as the colors of light softly change. 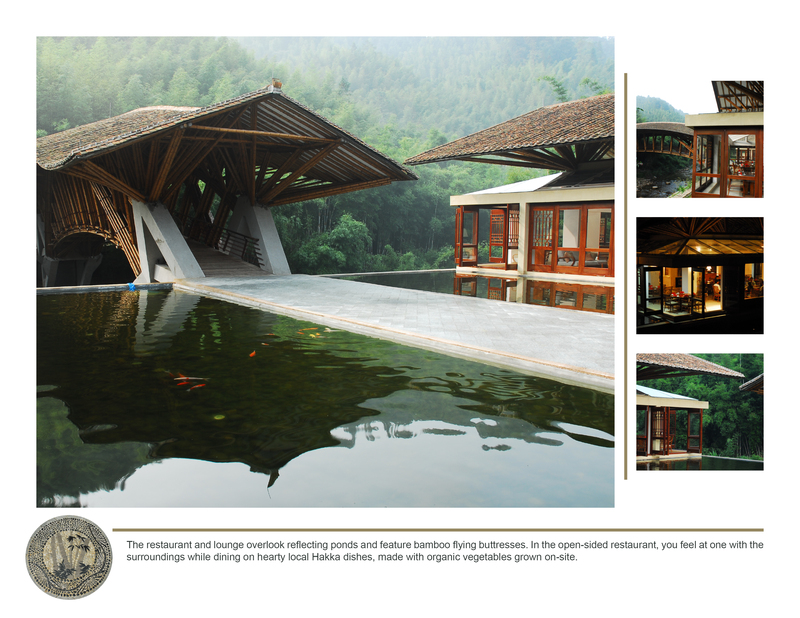 The restaurant and lounge overlook reflecting ponds and feature bamboo flying buttresses. In the open-sided restaurant, you feel at one with the surroundings while dining on hearty local Hakka dishes, made with organic vegetables grown on site. In Chinese culture, longevity is the most highly esteemed value of the five-fold happinesses. 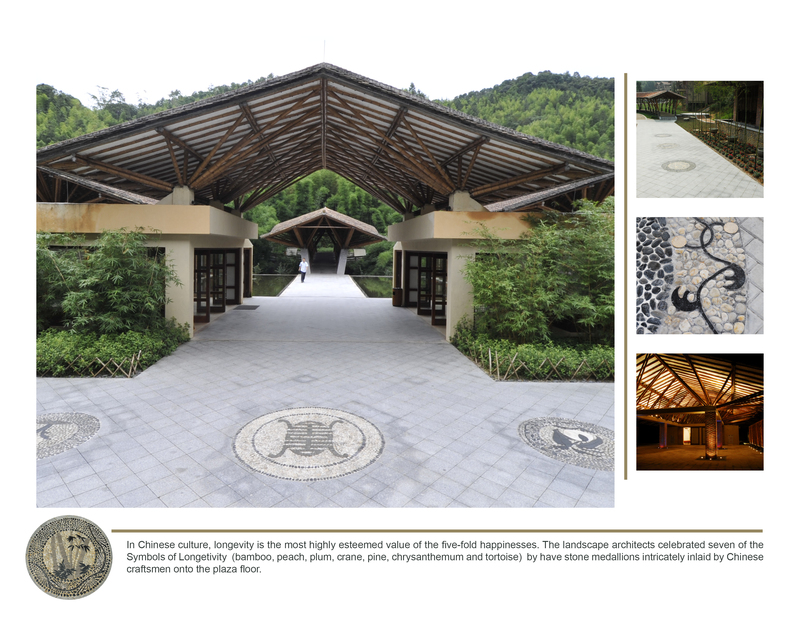 The landscape architects celebrated seven of the Symbols of Longevity (bamboo, peach, plum, crane, pine, chrysanthemum and tortoise) by having stone medallions intricately inlaid by Chinese craftsmen onto the plaza floor. The Garden of Cultivation pays tribute to the self-sustaining lifestyles of rural China and borrows from similar named gardens in Suzhou. 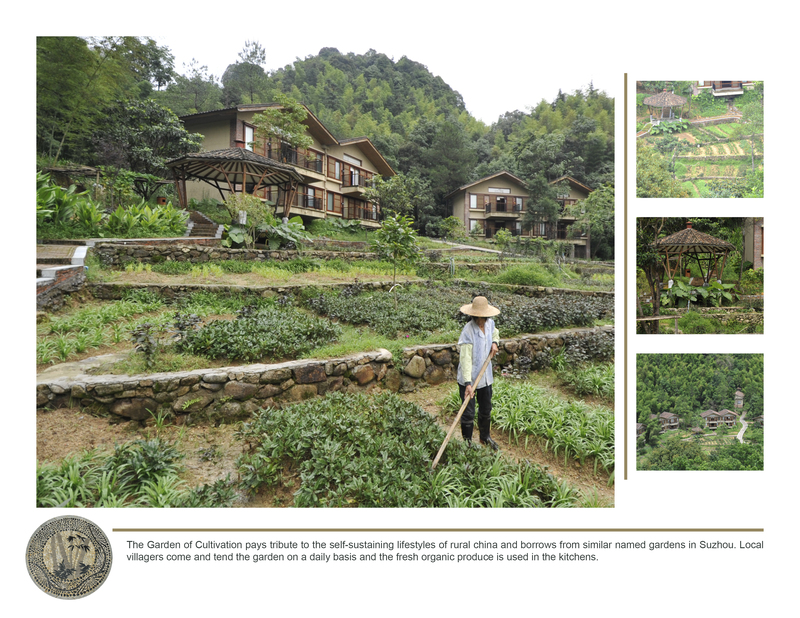 Local villagers come and tend the garden on a daily basis and the fresh organic produce is used in the kitchens. Fifty-three villas and suites sit along the river’s edge providing magnificent views. All of the villas and public buildings are sited in the most desirable feng shui configuration—with the hills in the back and the water to the front. 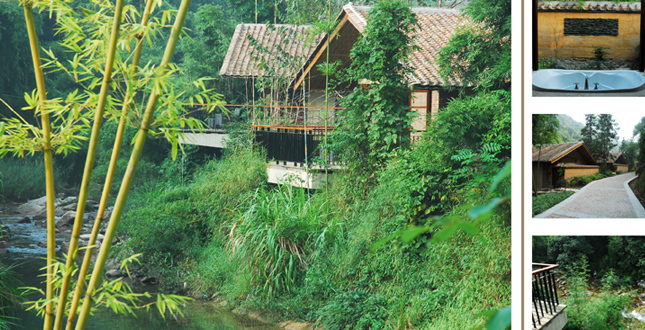 Villas provide views of the Ganken River, the bamboo forest or the many different gardens within the property. The Observatory Tower was sited to provide beautiful views of the river by day and the stars by night. A sense of place was created as the site was constructed with mostly organic materials found in and around the site. From the bamboo structure of the bridges and roofs, to the rammed-earth walls and recycled clay roof tiles, the project was literally a seed from the site. All plant species specified for the project are native to the region. 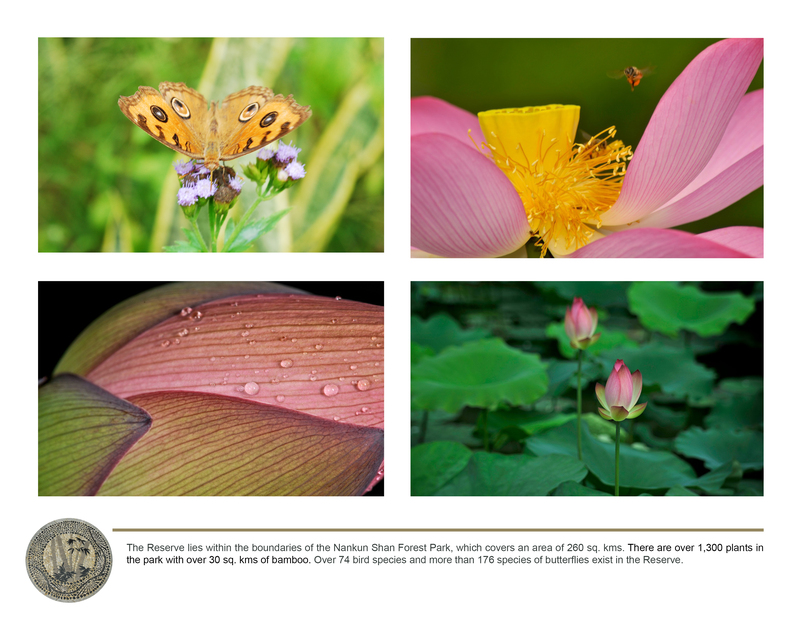 The Lotus Garden brings educational and environmental awareness to visitors contributing to a one-of-a-kind outdoor experience. 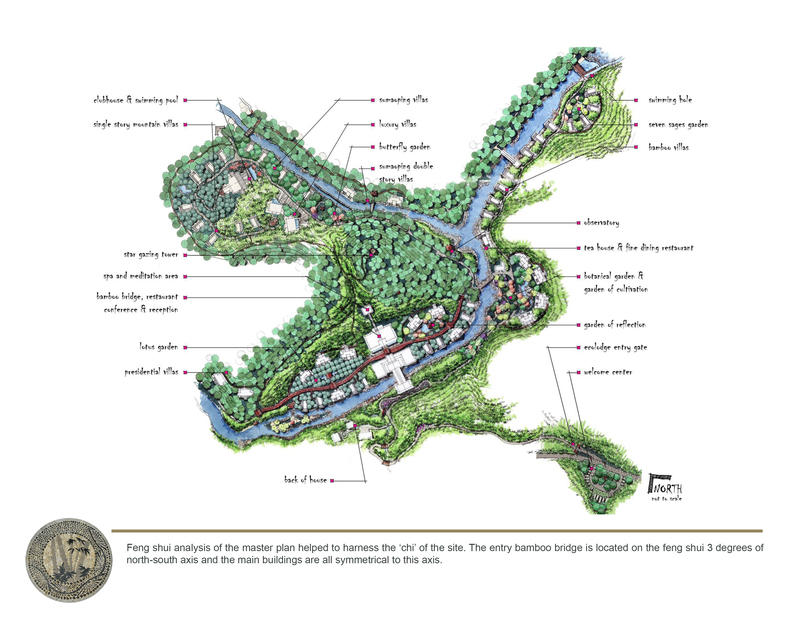 Each of the garden spaces throughout the Crosswaters property has its roots in Chinese poetry and history combined with existing site conditions. 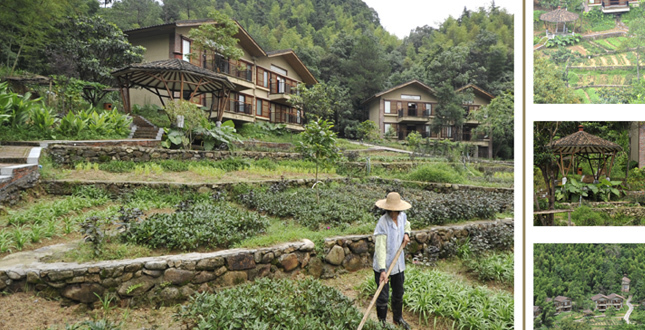 The goal for Crosswaters Ecolodge was the development of the first ecotourism destination in China and the creation of an experience that would draw a worldwide audience eager to learn about the surrounding ecosystems while giving back to the local community. Through in-depth environmental, social and metaphysical analysis and integration of organic and recycled materials, the entire project is a devotion to the highest standards of responsible design and implementation. Longmen Mt. 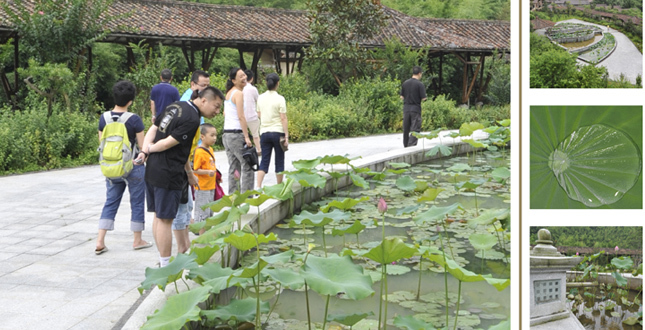 Nankun Zhongheng Ecotourism Development Co. Ltd., a company owned by Chinese Nationals, wanted to implement an innovative approach, holistic in nature, addressing many of the environmental and social problems that had continued to plague their country over the years. 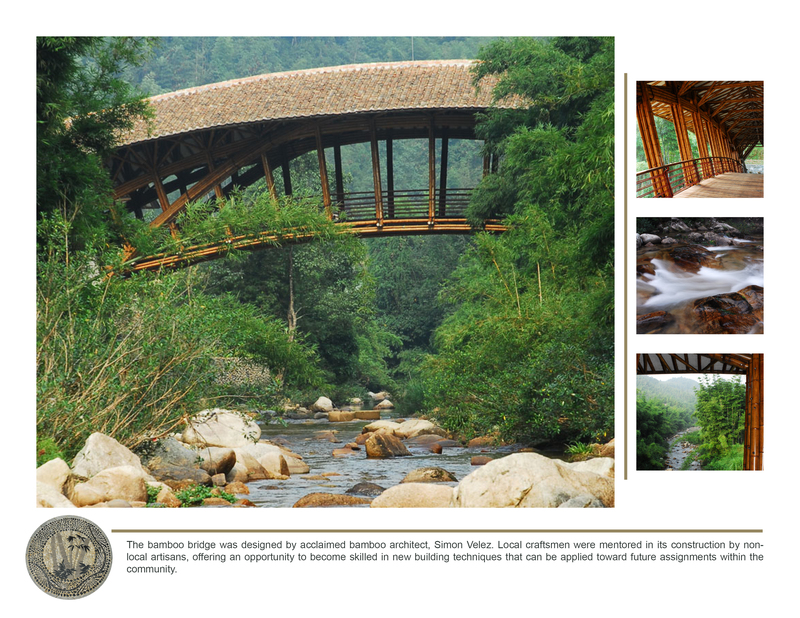 The client's goal was to develop the first ecotourism destination in China and they selected, as a setting, the forests of Nankun Shan Mountain Reserve, Guangdong Province, South China. 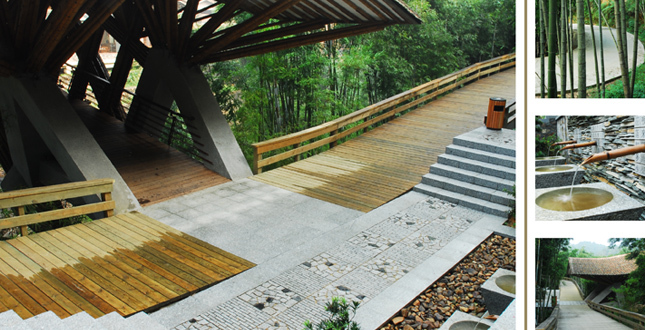 The Nankun Shan Mountain Nature Reserve lies within the Nankun Shan Forest Park located in Central Guangdong, 80 miles from Guangzhou. The park, which covers an area of 260 square kilometers and is home to over 1,300 plants and over 30 square kilometers of bamboo, the main species being Phyllostachys pubescens. The Nature Reserve was established in 1984 with its major objective to protect the subtropical evergreen broadleaf forest. Over 5,000 people live in the Reserve and their main income generating activity is the harvesting of bamboo for use in scaffolding in Guangzhou and Hong Kong. 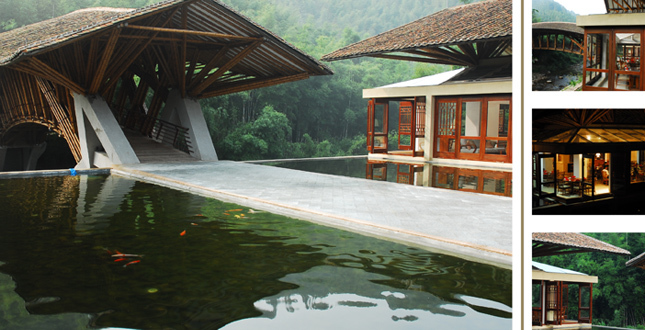 Crosswaters Ecolodge was the first project implemented as part of a 10-year overall ecotourism plan for the Nankun Mountain Reserve. The 10-year plan is to develop the reserve as an ecotourism destination providing a variety of experiences and accommodation facilities—from three-star to five-star resorts. Mountain climbing, hiking, boating, birding, tubing, cycling, walking, swimming, astronomy, wine tasting, fruit picking, wellness activities, and fish farming are among some of the experiences available to tourists. 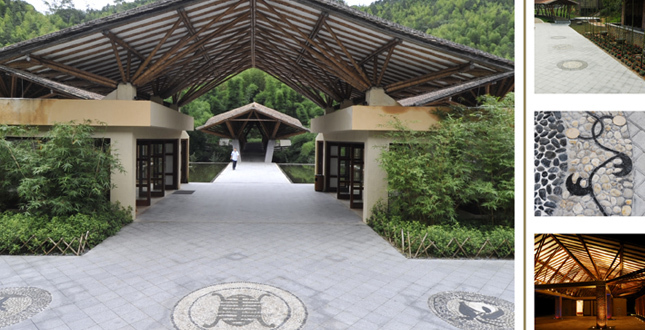 The plan also includes the development of a boutique 25-room lodge called Sumoaping River Lodge, a three-star village lodge, visitor and interpretation center in Shangping Village; a bamboo museum, retail and civic center in the village; and enhancement and building of new trails. 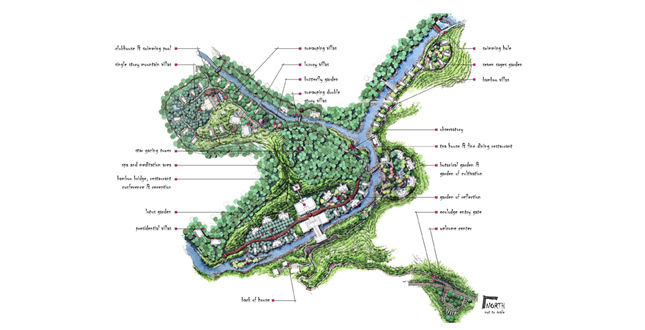 For the development of Crosswaters Ecolodge, the landscape architects performed an in-depth social, environmental, and metaphysical analysis. Three different on-site visits (one week each) were conducted during the winter, spring and summer. Quality time was spent on the site to understand and then study the ways of living of the local Keija people, who make up the majority of the population on the mountain. Particular attention was paid to their internal spaces and relationships to gardens and philosophical connections with the bamboo. The design team looked for clues and responses from what they observed in relationship to drainage, existing agriculture, water levels, seasonal visitor traffic and industry. 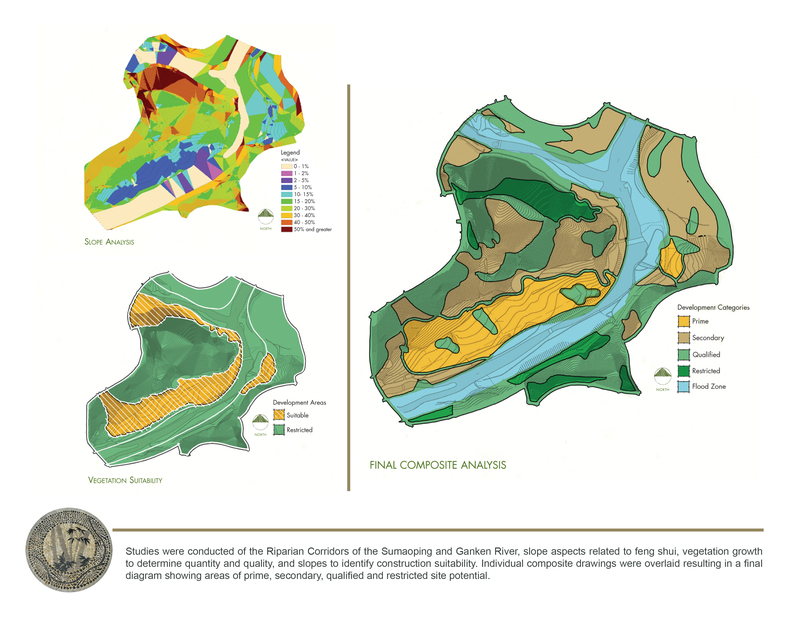 From the physical topography base map provided by the client, GIS was used to generate several layers: watershed, vegetation, hydrology and land use. GIS add-ons Spatial Analyst and 3-D Analyst were also utilized to create slope, elevation, slope aspect analysis and 3-D terrain analysis layers from which the optimum locations for the various buildings were identified. For the metaphysical site analysis a local renowned Feng Shui Master with 20 years experience was brought in to help analyze the 'chi' (Chinese word for energy) of the site. South China is the center of Feng Shui beliefs and thought processes and it was felt that the local cultural and spiritual values needed to be respected. It was crucial that the 'chi' of the site not be disturbed during development. We requested the client organize a kick-off meeting with the local community whereby we interacted with the local Keija community and heard their views on ecotourism development in their surrounding areas. Several discussions were held during which local wisdom and knowledge was tapped to ensure that valuable information about the site was used to develop a truly authentic ecolodge. The opportunity was also taken to inquire about local bamboo artisans and craftsmen/craftswomen. Several awareness-building presentations on ecotourism and ecolodges were also presented to local authorities. The local people were brought into the planning process from day one. Members of the local council and leading citizens from the main village made valuable contributions. There was significant community participation and the landscape architects received regular feedback on the various alternatives that were presented to the client and local people. One of the greatest challenges, the language barrier with the clients and local craftsmen, also served as a great benefit. It forced the design team to explore a more artistic way of constructing the design elements. While some traditional construction drawings were used, many of the design elements were completed by local craftsmen using hand sketches and rough scale models with materials found on site. 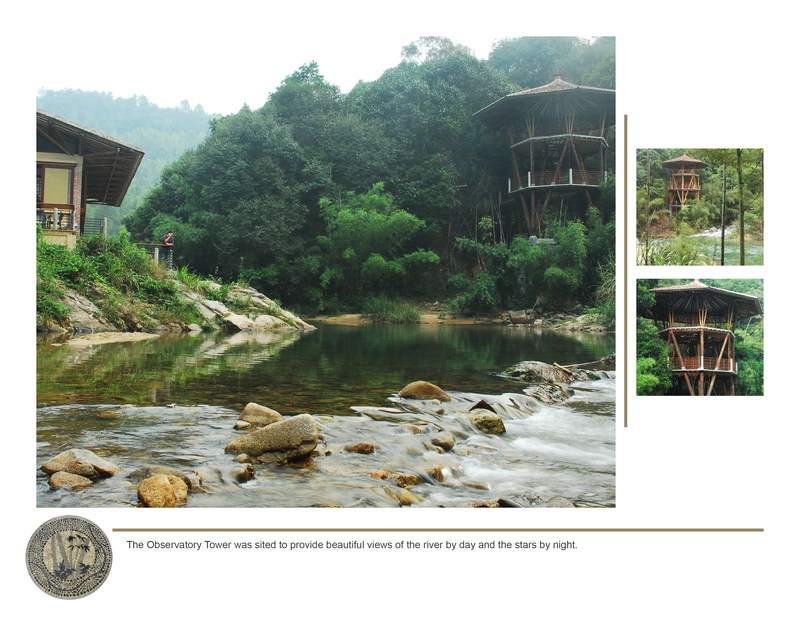 The Crosswaters Ecolodge is a celebration of bamboo, reflecting its context with the surrounding bamboo forests. Bamboo is known as the "friend of the people" in China because of its diverse use in everything from food and cooking to furniture, paper, musical instruments, boats and home. 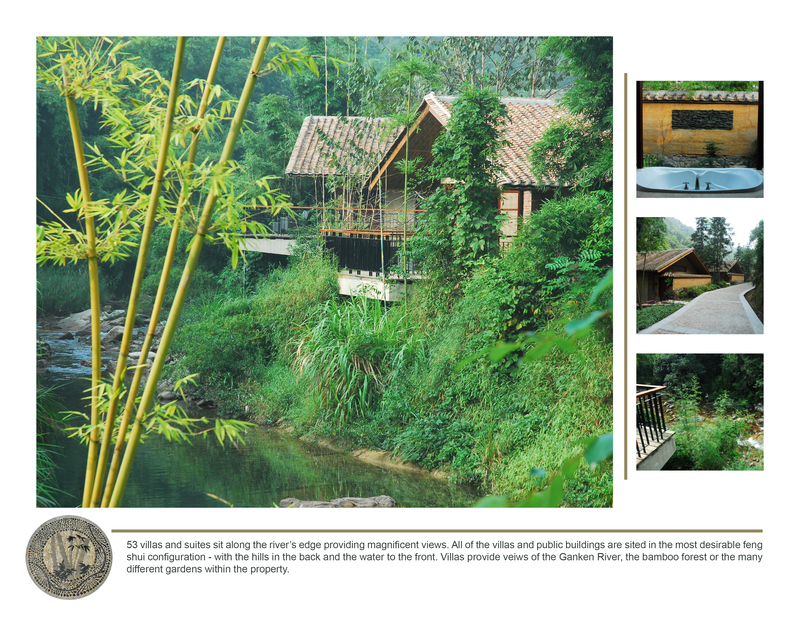 The spirit of the bamboo is celebrated in the landscape architecture, architecture and interior design of Crosswaters Ecolodge. All of the linens are even made of bamboo. 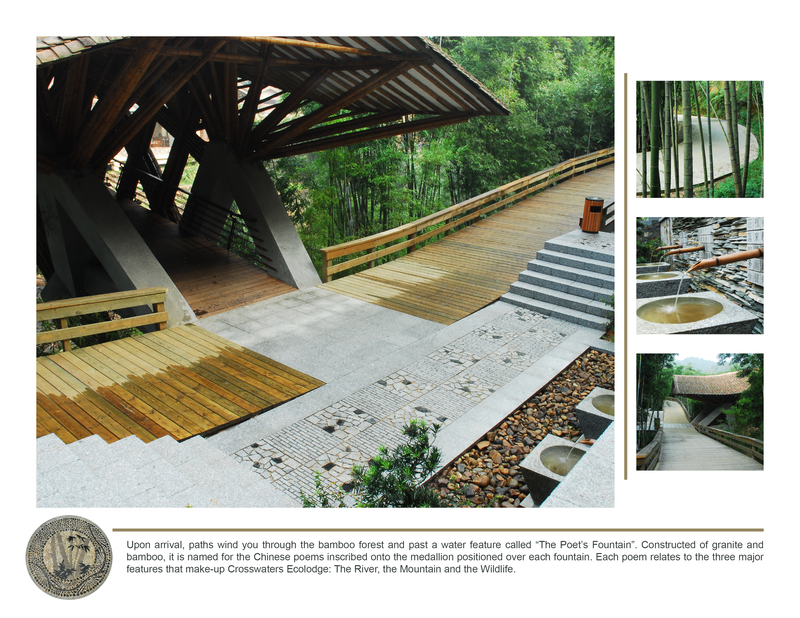 The Ecolodge is the largest project in the world with regard to the use of bamboo in a commercial development. It is also the first instance this method of construction (bamboo as a structural member in a place of habitation) was introduced in Asia in a large project. 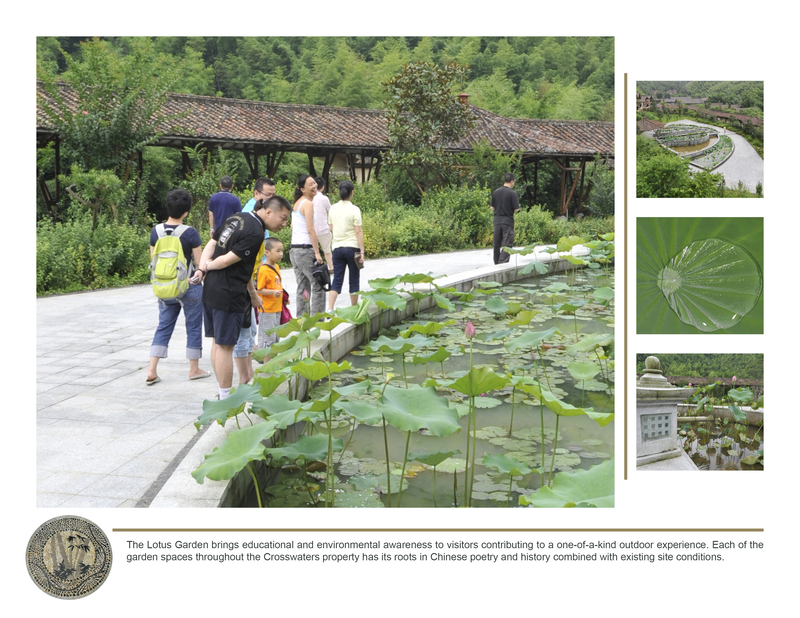 Crosswaters also celebrates the rich garden history of China. The landscape architects researched and analyzed ancient Chinese gardens such as Tao, Shouzhou and Imperial Gardens (Summer Palace, Forbidden City) to understand the relationships between inside–outside and cosmic orientations of buildings and gardens. An understanding of Chinese garden design elements led to research into the poetics of traditional garden design. This research was then used in the planning and design of the various gardens. 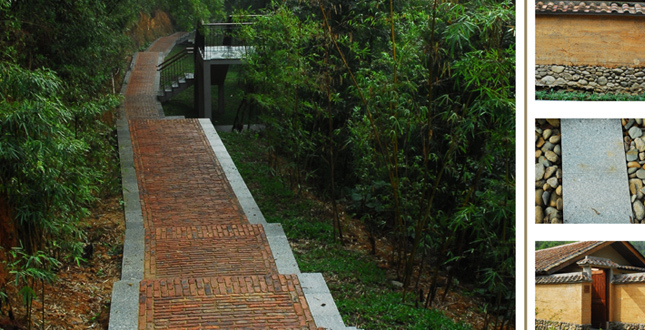 The botanical garden showcases bamboo species from China and acts as an interpretive experience for guests. 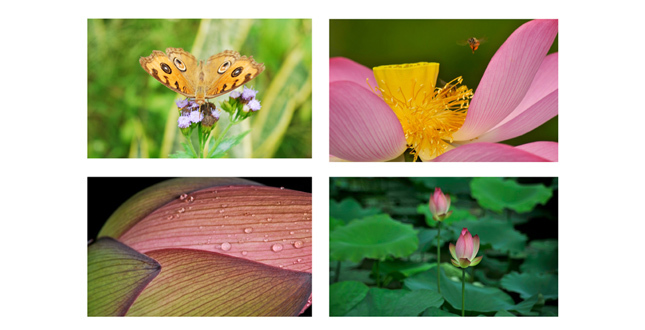 Other gardens include a Lotus Garden, Reflective Moon Garden, Seven-Sages Tao Garden, Bamboo Sculpture Garden, Butterfly Garden and an Organic Rice and Vegetable Garden. All plant species specified for the project were native to the region. There are no exotic species. The contractor was also issued sustainable construction guidelines. 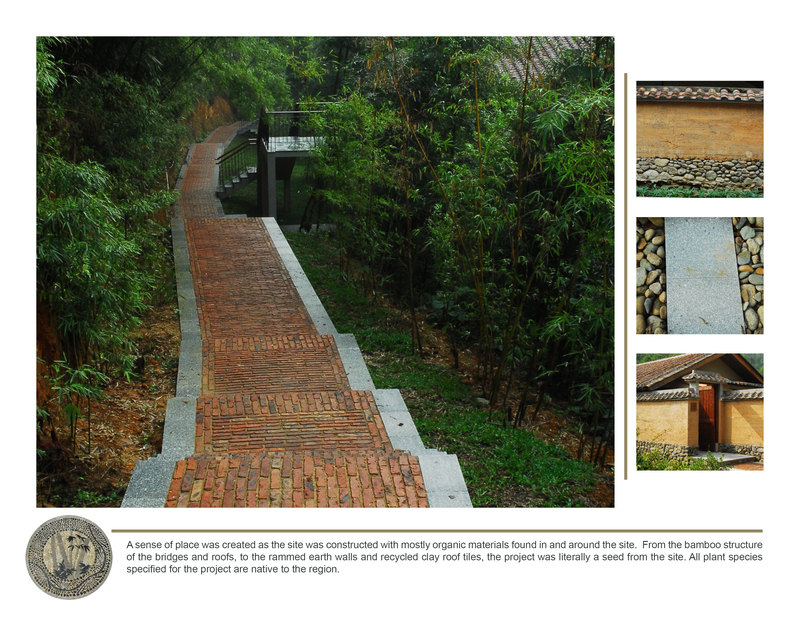 There was extensive use of abundant local materials such as bamboo, earth, clay tiles, marble and river stones. A lot of the building materials are recycled and reused, such as the boardwalks being made of railway ties. Local craftsmen were brought in to help with all the rammed-earth wall and bamboo construction. 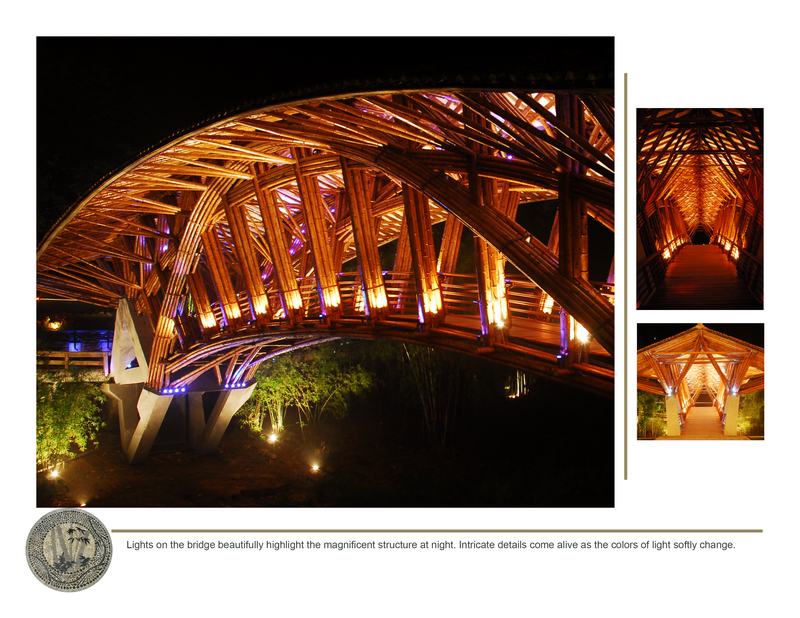 The landscape architects helped the client build a truly international consultant team including the top two bamboo designers in the world. The core consultant team represents all the six continents of the world. The rest of the expertise was local, both from academic and professional fields. The architect of record is based out of Guangzhou and some of the most well-renowned professors in South China provided input in ecology, ornithology, plant selection, horticulture and tourism history. Taking into account language, culture, spirituality, and the diverse regions of the world, Crosswaters Ecolodge is an excellent example of sharing and learning from the vast knowledge offered by the land, water, astronomy, the universe and the people.